When Sharon asked if I'd collect the money at the October meet I agreed, blissfully unaware that with such responsibility also comes the job of writing the meet report.... so here goes. 15 of us arrived at the hut at various points during a wet Friday afternoon and evening. Those who hadn't read the instructions got lost – understandable for those of us who, like me, have never realised that North Ballachulish is on the other side of the bridge to Ballachulish. There must have been a few drinks shared and a later bedtime for some on Friday night as I heard murmurs of a few sore heads on Saturday. Otherwise the day started off well, being dry and clear (if windy) compared to a fairly awful forecast. The party split into four groups. 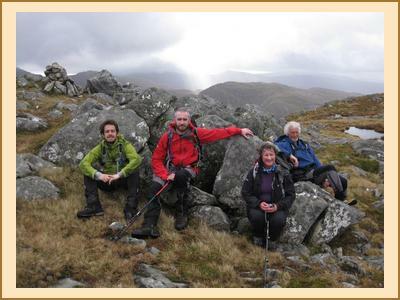 Nigel, Fiona, Marcus, Martin & Ian E set off to do 'Nigel's graham' - aka Sgurr a'Chaorainn. They reported a cracking pace by Martin on the 'high route' whilst Nigel and Fiona took a more relaxed approach on a lower route. 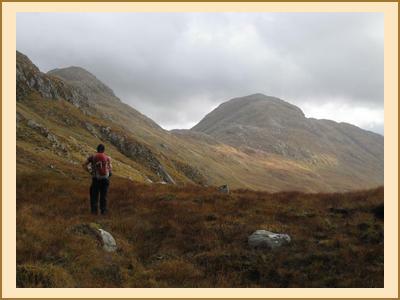 Ian L, Kate, Gillian F, Gill and I set off for a Corbett and Graham combo (Meall a’ Phubuill & Meall Onfhaidh) and, in between the odd shower, enjoyed great views right across to the top of Ben Nevis which was clear for most of the day. Ian and Gillian decided to sneak in another Graham but the rest of us opted out and headed for the nearest coffee shop, which turned out to be Morrisons supermarket, the only place to get coffee and scones in FW at 5pm. Pauline and David climbed the Pap of Glencoe and enjoyed a wander by the shore whilst Chris, Clare A and Katrina headed for the climbing wall rather than brave the weather. In the evening a rather wet Claire and Antti made a welcome addition to the group, especially as they came bearing gifts of Finnish vodka from their recent trip. Entertainment was provided by a pretty impressive thunder and lightning storm that required a ‘lights out’ in the living area so that it could be viewed in full splendour. It then pretty much rained all night and so Sunday brought a relaxed start as it was agreed there would not be much walking today. Most of us headed straight home, admiring the waterfall at Glencoe on the way, whilst a few others headed for the climbing wall. Despite the weather it was an enjoyable weekend as always. Hopefully more luck weatherwise for the dinner meet next month.